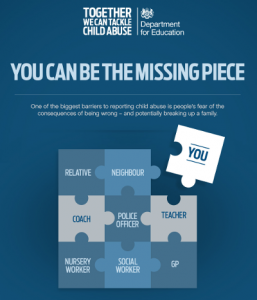 South Gloucestershire Council in partnership with the South Gloucestershire Safeguarding Children Board is supporting the Department for Education’s (DfE) campaign which aims to encourage the public to report their concerns in order to get help to children more quickly. 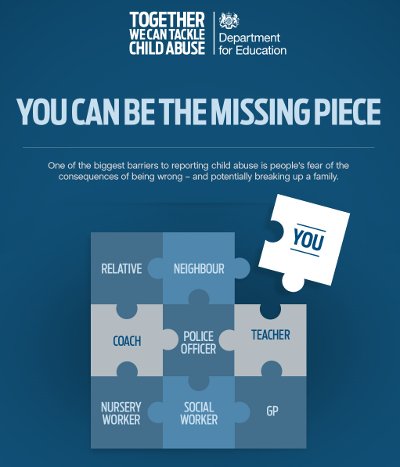 Through the campaign we hope to raise awareness of the signs to look out for which could indicate a child who is being abused or neglected and to remind members of the public who they should call if they are concerned about the wellbeing of a child. If you have ANY concerns about possible abuse you should report them by calling 01454 866000.